I hadn’t given quilts much thought until I was a young adult and my mother gave me a quilt wrapped tightly in plastic. It was a variation of a nine patch quilt. 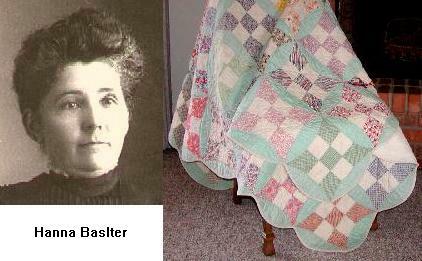 She told me my great grandmother Hanna Balster had made it for me. Hanna had made one for each of her future great grandchildren. My mother told me to take very good care of it as it was a precious heirloom. As a result it stayed in that plastic package for over 30 years. I know now that a quilt should never be stored in plastic but I was lucky. I’ve always lived in dry country so there was no mold damage. Years later when I had time to learn to quilt, that quilt became much more precious to me. It hung above the door in our split level entry where there was never direct light. Seeing it there was an inspiration to me and aroused my curiosity about the history of quilting. Mother remembers her grandmother, Hanna, as loving to talk on her telephone while stitching on quilts. That old time telephone was on the stair landing with a bench where she could sit. Hanna also had a big quilting frame in her parlor and women gathered there frequently where they chatted with each other while quilting. There is no doubt that Hanna was a social woman. Minnie Hanson, was a far more reserved person than her mother. She loved reading and might well have been a writer had she been born in a later generation. While my great grandmother made dozens of quilts in her lifetime my grandmother made only one, a Crazy Quilt. Perhaps she made it because Crazy Quilts were all the rage among young women of the time. It was finished around the time of her marriage in 1904. Because of my passion for quilt history my mother passed this lovely Crazy Quilt on to me. It is unique in that it is made out of upholstery fabric so it is holding up far better than Crazy Quilts of silk. Interestingly my grandmother’s quilt was made many years before the 1930s quilt that my great grandmother made. A pattern for Hanna’s quilt that you are welcome to use. 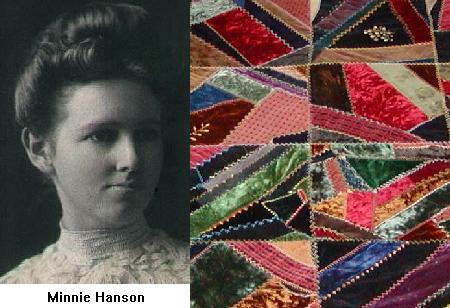 More about Hanna and her quilts. More about Minnie and her quilt. A short essay on Minnie and her life. How beautiful are both the quilts and your grandmother’s! Thank you for sharing that and for ‘Womenfolk’, I’ve been exploring the site for a little while and am amazed at all the information presented. Every time I learn something new about quilting and am amazed by some of the beatiful quilts that have stood the test of time. I’ve enjoyed reading your post this a.m. Your quilts are fabulous! Now, I’m off to go thru all the links you provided : ) Enjoy the day.